The communications industry is in a constant state of evolution. From AI to 5G and IoT, there are a whole lot of trends and new technologies reshaping the way audiences connect to the world. Yet mobile phones have remained a constant in the last decades. With 80 per cent of people checking their phones within 15 minutes of waking up (and 50 per cent checking at random during the night), they’ve become extensions of us in many ways. And they meet a whole range of requirements – who needs a watch or a calendar when you can check the time, date and your messages with the swipe of a finger? Staying in tune with mobile technology is crucial for marketers. The ongoing reliance on mobile has allowed for direct, one-to-one messaging at a time when everyone’s attention is otherwise split across hundreds of digital platforms. Greater connectivity also means customer data is more readily available, so businesses have no excuse not to tailor communications for a more personal touch. 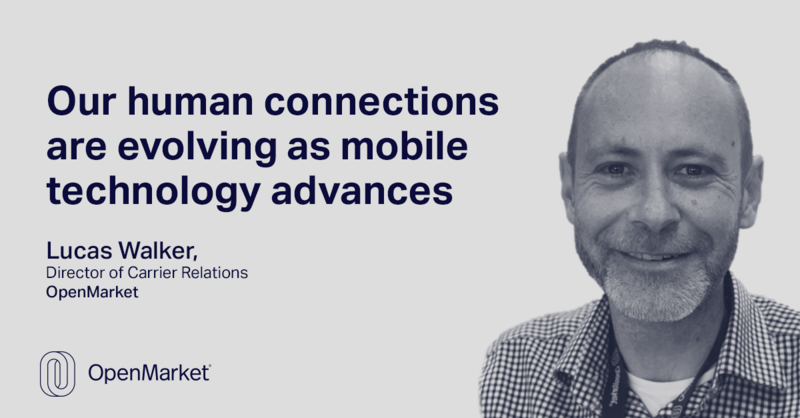 But new developments in the mobile world are changing the ways businesses interact with their audiences and strengthening the connections between them. This was particularly evident at this year’s Mobile World Congress (MWC). Here’s what you need to know. At this year’s MWC, several new technologies shined – including wearable and foldable phones that showcased the future potential of 5G, intelligent RCS developments, and the new connectivity of IoT devices, from smart cars to the family fridge. In the not so far off future, AI paired with sensors will allow for new infrastructure-building capabilities and 5G will lead to the connected, self-driving car. Alongside these other technologies, OpenMarket showcased brand new RCS featuresthat are set to change the communications landscape. After launching the world’s first RCS campaign with Virgin Trains and Vodafone six months ago, we announced our latest project – making RCS possible for all businesses with Google, Sprint and 1-800 Contacts. Our initial trials revealed customers are eager for rich, engaging and interactive messaging. Conversion rates were a massive 140 per cent higher for RCS sales offers, and Virgin Trains experiencedzerocustomer opt-outs from RCS notifications. What does this tell us? Well, as communication became faster and stronger across all platforms, the rules changed. Audiences are increasingly experiencing advertising fatigue as a result of constant bombardment in their everyday life. We are being marketed to everywhere we go, whether we’re reading the news, sitting on a bus, walking the streets or opening an app. Simply put, advertising is unavoidable. Recent studies also highlight this onslaught is leading to an increasing desire for more human connection when interacting with technology. So, when customers received direct, useful and interactive RCS messages that answered genuine needs, the results were clear. At the heart of many MWC announcements was a renewed focus on empathy and customer experience. Empathetic brands don’t just deliver useful, timely experiences that customers want. They also help customers avoid experiences they hate – like unwanted messages. Automation and artificial intelligence opened up more opportunity for messaging that meets the criteria brands have long been striving for: reaching the right person, at the right time, in the right place, and on the right platform. This means protecting customer’s privacy, ensuring security and eliminating spam. But when brands get it right, new mobile technology will ultimately allow highly personal messaging that’s both automated and scalable. The power of 5G combined with RCS will enable richer, more interactive messaging, while an astronomical amount of data will give us the ability to get more targeted than ever. As desire for faster service, stronger relevance and greater connectivity increases, businesses will need to rethink how their marketing tools work for the audiences of the future. It’s an opportunity for all brands to form deeper and more meaningful relationships with their customer base. Find out more about how OpenMarket is at the forefront of the RCS revolution.